Come August and the patriotic fervor comes alive. 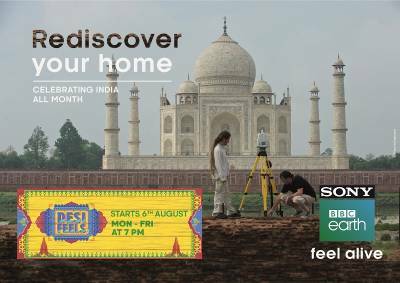 This year, India’s most loved premium factual entertainment channel, Sony BBC Earth, has a Desi treat for its viewers. The channel is celebrating India all month long by hand-picking some of the best untold stories and never-seen-before facts that showcase a unique side of our country. The Desi celebration begins on 6th with a new slot ‘DESI feels’. Every day at 7 pm, watch stories that make India extraordinary in revered shows like Rick Stein’s India, Kolkata with Sue Perkins, Tuning 2 U: India’s Lost Musicians, Kumbh Mela, Hidden India, Joanna Lumely’s India, World’s Busiest Cities – Delhi, India’s Deadliest Snakes amongst etc. That’s not all! The channel is introducing a one-of-a-kind classroom called ‘Mosley Ki Paathshaala’ with medical journalist and New York Times bestselling author Dr. Michael Mosley. A renowned health expert, Dr Mosley will bust popular Indian myths about food and health that too in HINDI! Spoiler alert – he knows a lot more than just ‘Namaste India’. These snippets will be followed by special episodes from remarkable shows such as ‘Trust Me I’m a Doctor’, The Truth About Exercise’ and ‘Countdown to Life- The Extraordinary Making of You’. Feel Alive with an adventurous journey of music, nature, wildlife, health and everything else that is truly India only on Sony BBC Earth.